Real Name: Captain Kara Thrace. Group Affiliation: Crew of Battlestar Galactica. Base Of Operations: Battlestar Galactic. Height: 5’6” Weight: 140 lbs . 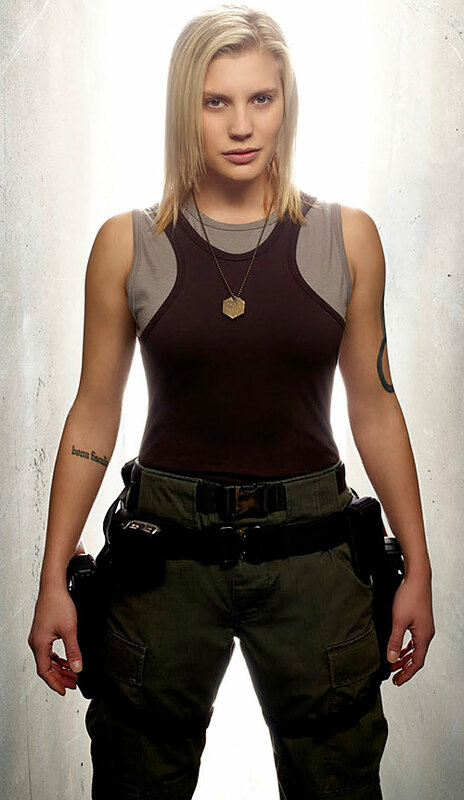 Kara “Starbuck” Thrace is a highly trained and viciously effective combat pilot. She is a military officer with a wide streak of rebelliousness that is tolerated in the desperate world they live in. Kara is an effective brawler, and is skilled in combat small arms and as a sniper. 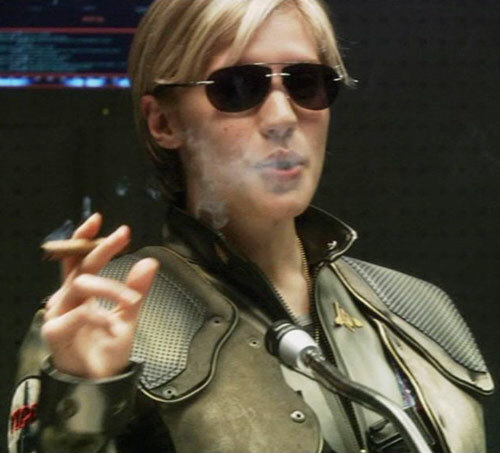 Kara Thrace was assigned to Battlestar Galactica at the time of its decommissioning. Instead of the powering down of the last of the Cylon-War era Battlestars there was a Cylon massive first strike. All 13 colonies and nearly the entire fleet were destroyed in a combination of nuclear and information-warfare. Starbuck was one of the few remaining pilots in a truly dangerous world. The Fleet was under constant harassment and pursuit by a better armed, better informed Cylon fleet. Starbuck engaged in more than a few dogfights and some downright insane maneuvers. Starbuck also managed to understand and fly Cylon ships by intuitive process. Her loyalties swayed several times as circumstances changed and colossal mind-bending challenges ensued. As the Cylon pursuit enters its second year Starbuck serves the human race and the Galactica fleet as best as she can. After the Pegasus arrived and tensions grew high between the two Battlestar commanders Starbuck was sent as an assassin to kill Admiral Cain by (then) Commander William Adama as a last resort. She was never required to pull the trigger but was changed by the experience. A slim, attractive blonde and athletically built. Kara is foul mouthed, rebellious and often spoiling for a fight and is well loved for it. Starbuck has to always prove herself even when circumstances don’t call for it. She is a classic case of over-compensation for perceived weaknesses. She is a cigar smoking, heavy gambler who is always willing to take on any man, woman, Cylon or beast to prove who is best. Recently she has become haunted by the deaths of pilots around her. It also bothers her that she has not been able to return and rescue the human resistance members on Caprica as she had promised. Alternately you could have the Galactica arrive at Earth with the Cylons in pursuit, bringing their war to the DCU’s doorstep. Or worse, maybe the Cylons have arrived ahead of the Galactica and begun infiltrating Earth’s population. The robotic Manhunters were revealed as having done something similar in the Millennium mini-series. Rank: (CAG, Colonial Fleet), Lightning Reflexes. Admiral William Adama (High), Lee Apollo (High). Dark Secret (Abusive childhood), MPI (nutty one-upmanship); MPR (Bad Knee. If her knee goes out she loses 1 AP of current body and drops to 2 APs movement speed; Guilt (Zak’s death- removed by middle of second season). Helper(s): http://scifi.com/battlestar/characters, Roy Cowan, Woodrow Hill.